Mangala Samaraweera, in supporting the report submitted by the Steering Committee on constitutional reform, called for a constitution that ‘will help our nation put its past behind for good and move forward with renewed hope.’ On the face of it, this is a positive statement. Mangala’s speech also alluded to the Sathara Brahma Viharana or the four divine abodes, metta, mudita, karuna and upekkha (oving-kindness, compassion, sympathetic joy and equanimity). It is telling that Sumanthiran is silent about Articles 10 and 14 (1)(e) while make Article 9 nonsensical. That said, if Article 9 is ineffective, it should go or else Articles 10 and 14 (1)(e) should go. A third alternative would be to reformulate these articles to make Article 9 effective. The inconsistency with Buddhist philosophy would remain, however. The politics of this whole story ties up with Mangala’s dump-history call. It is not innocent and neither is it progressive. First of all, history, whether we like it or not, bears upon the present and future. Constitutions have not, do not and will not fall from the sky. Societies and cultures are wrought over time. They are not cast in stone of course and are necessarily altered over time, for better or worse. Dumping history is mischievous because the past has seen violent and bloody persecution which cannot and should not be forgotten. 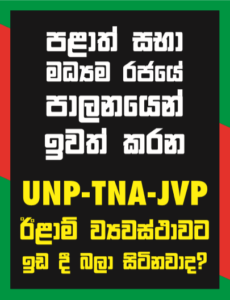 One notes that neither Samaraweera or his political friends have clean histories and neither are they ready to do the forgive-and-forget of past wrongs perpetrated by political opponents. They are right in the middle of a revenge game, as were their predecessors. More seriously, Sumanthiran is a Christian, and his religious community has had it good for centuries at the expense of Buddhists and Hindus. Asking Buddhists to act as though they have achieved one of the four levels of enlightenment is a a bit much, especially when it is a call made by someone who cannot claim to be adhering to the Christian doctrine to the letter. If, then, the Sinhalese and Buddhists have done him or his community (Tamils and Christian) wrong, he should grin and bear. He could also read further and encounter Matthew 10.34 (or read back and find the many examples where violence is advocated in the Old Testament): “Do not assume that I have come to bring peace to the earth; I have not come to bring peace, but a sword.” He could use this to call for armed insurrection or justify it, as his party and its constituent political groups did for many years. So if you want to dump the past, it either means that you find history uncomfortable due to the complicity of your faither or its adherents in genocide and ethnic cleansing or you really don’t have much of a past to talk about. There are other pernicious subtexts to this dump-history theory. The advocates don’t want history dumped, but want only certain parts of it dumped, in this instance the ‘Buddhist’ part of it. If you want to put the past behind, you have to acknowledge that this past included Tamil chauvinism in the form of the Vadukkoddai (Batakotte) Resolution, the twisting of myth into history, fiction into fact, the use of lines arbitrarily drawn by the British as borders of so-called ‘Historical Homelands’ and the attendent attempt of land-theft. Is Sumanthiran or Mangala talking about this past? Are they demanding that fiction was a key element of this past, that it should be called as such, that it should therefore be dumped and along with it the whole devolution-thesis (for reconciliation, equality, respect etc) should be scrapped? No, they are not saying all this. They are not advocating accordingly either. If Sumanthiran and Mangala want ‘change’ and want to dump the past and ‘move forward’ then all legislation at odds with notions of ‘equality’ or which supersede general laws pertaining to freedoms should go. Why is it that Sumanthiran and Mangala are silent on the Muslim Marriage Laws, the Thesavalamai Law and the Kandyan Marriage Laws? Why don’t they visit Article 12 of the Constitution (which speaks of the Right to Equality)? How is it that these individuals, who argue for a secular state, do not see that the state IS religious and not on account of Article 9 [which, as we said, is negated by Articles 10 and 14 (1) (e)]? Why do they not speak a word about religious holidays? Why don’t they note that ‘Buddhist holidays’ were reduced from 49 to 13, while there are 54 Christian holidays, 3 Hindu holidays (sadly, one might add, given all that’s being said about equality), and 3 Muslim holidays supplemented by the equivalent of 13 work days (for Friday prayers) as well as lenghty leave options (four months and ten days for Muslim women in the event of the husband dying and three months in the event of a divorce)? These come under ‘customary law’. However, custom, by definition is about history. It is about the past. It affirms culture and religion. If you want to dump the past, you can’t keep these things intact. But Sumanthiran and Mangala are quiet about such things. Why? Why? Because they are not innocent. Because their intentions are not pure. Because they are playing selective-politics with the past, present and future. For those who love to bash Buddhists, often quoting the Buddha, let me recommend that they try a bit of self-reflection, you know, ‘be a bit Buddhist yourself’ kind of exercise. Check the material your walls are made of. The chances are they are made of glass. So, to conclude, let’s go secular. Let’s go the whole hog. No more religious holidays. No more Poya days. No special hours off work for prayers. No Christmas. Let the ‘weekend’ be shifted to any two consecutive days barring Sunday and Friday. And let there be no state subsidies for any religious schools including pirivenas. And while they thus reflect, let them also note that in officially non-secular states and even in many ‘secular’ states, particularly those that have Christian or Muslim majorities, there are no holidays for other faiths. Let them note, also, that perhaps it is the Buddhist character of this society that has permitted the religious freedoms even to the point of privileging other religious communities. Sumanthiran states, “a Constitution that gives a particular religion the foremost place cannot be a Constitution that treats all of its citizens as equals.” He is correct. Let him apply this logic to every letter of the 1978 Constitution and it’s 19 Amendments. He could do the relevant perusing with his ardent fellow-traveler in the matter of constitutional reform, Mangala Samaraweera.